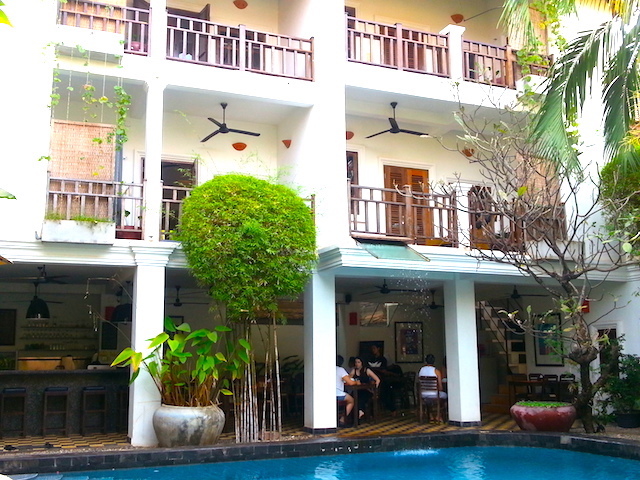 I stayed at the Rambutan Hotel & the Rambutan Resort in Siem Reap, Cambodia, in the first week of March, 2016. 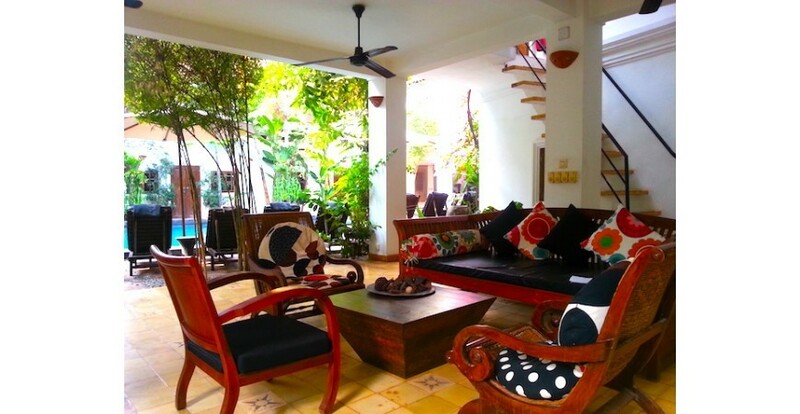 They are both under the same management and located 50m apart in the same alley about 5 minutes from the old market in central Siem Reap. The Rambutan Hotel was once known as the Golden Banana. Reservation & Check-in: I reserved via the hotel's own website, which offered better rates than online booking services. 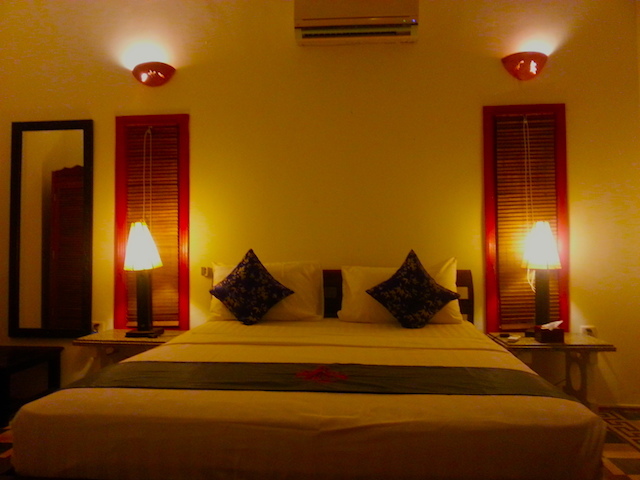 As of the time of this writing, room rates at the Rambutan Hotel start from 69USD and at the Rambutan Resort from 79USD. Breakfast is included. 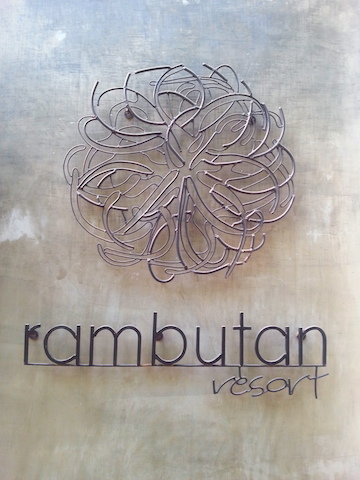 Check-in at the Rambutan Hotel was very smooth. I had warned them by email that I would be arriving on a late flight. There was no problem with arranging airport pick-up after midnight. A driver sent by the hotel was waiting for me. The website currently lists airport pick-up at 9USD. Building: The Rambutan Hotel is in a smaller building than the Rambutan Resort, but both are decorated in the same neo-colonial style, both are embellished with lush greenery, and both have swimming pools -- the one at the Rambutan Hotel is smaller. The hotel has 2 floors and the resort has 3. The lobby of the Rambutan Resort. Room: My room at the Rambutan Hotel was on the 2nd (1st if you're European) floor, directly over the small dining area. To access it, I had to climb up a steep and narrow wooden staircase. Once upstairs, I discovered that my private balcony overlooked the pool (see below). My room's balcony is mostly obscured by the pink flowers. It was large enough for several chairs and a small table. The room itself was well-furnished and attractively decorated. I was pleased to find that there were sufficient electrical outlets to plug in all of my devices. The wifi signal was strong, perhaps because this room was near the front desk. I could have wished for a reading light. My room at the Rambutan Hotel after dark. I stayed in this room for several nights. 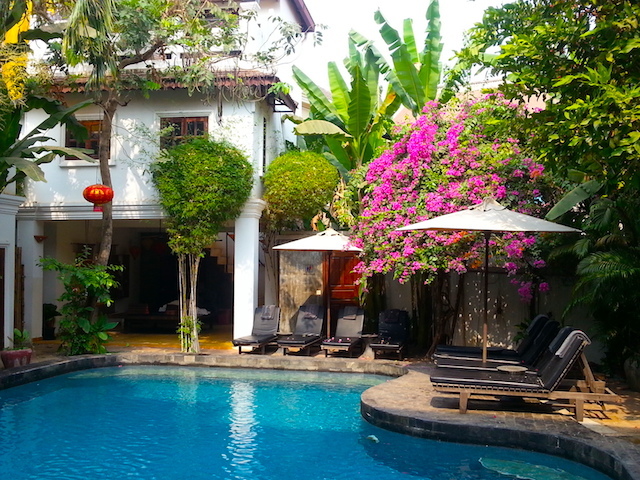 My friends were staying in another room across the courtyard, above the little bar. Actually, their room was on 2 levels, as most seemed to be. My friends then left and I went off to Battambang for a few days (read my post about it here: http://lotusandpersimmon.com/lpshop/blog/17_lp-travels-battambang.html). 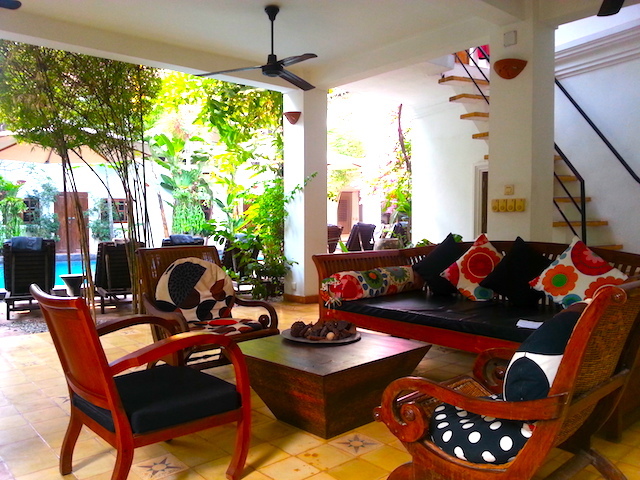 When I returned to Siem Reap, I checked into the larger and slightly more expensive Rambutan Resort down the lane. Once again, my room was on the 2nd (or 1st) floor, but this time over the lobby. It was more spacious than my room at the Rambutan Hotel, and had a somewhat more elaborate bathroom. My room at the Rambutan Resort. 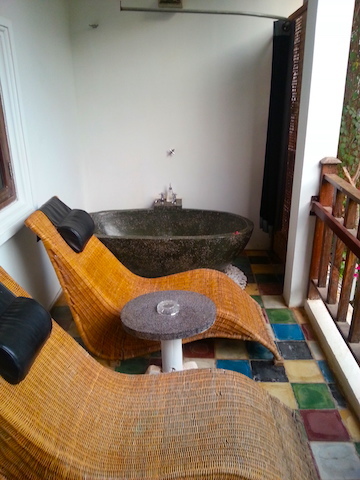 The spacious balcony featured wicker loungers and, oddly, a bathtub. I just used the shower in the bathroom. The balcony of my room at the Rambutan Resort. 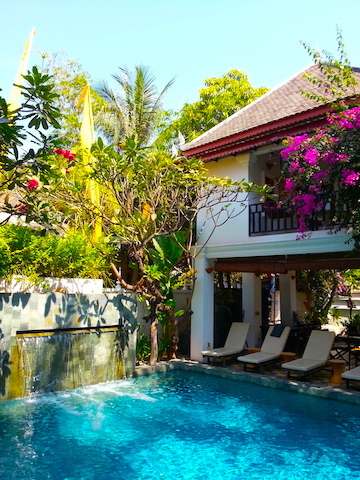 Facilities: As mentioned, both the hotel and the resort have swimming pools. The pool at Rambutan Resort. The restaurant is at the resort, but meals can be delivered to the hotel. Both the hotel and the resort have bars. Food & Beverage: Breakfast for guests of both establishments is served in the restaurant at the resort, which is only a 30-second walk from the hotel. Lunch and dinner can be ordered and served at the hotel, in which case a staff member will bring the food over on a tray. Being larger, the bar at the resort is livelier than the little one at the hotel, which is mainly used to supply drinks and snacks to guests lounging poolside. I can't remember what all the breakfast offerings were, but I remember enjoying my scrambled eggs, toast, French jams, tropical fruit and coffee. As mentioned above, breakfast is included in the room rate. I never ate lunch at the hotel or the resort, and dinner only once at the resort, on the evening I returned to Siem Reap from Battambang. It was a tasty local fish, lightly fried and served with rice and vegetables. A view of the Rambutan Resort's bar and restaurant area seen from the pool. Service: The staff are really the highlight of the place. All of them are young local people. Every one I encountered was friendly, polite, helpful, efficient, eager to please, and competent in English. At one point, I helped to interpret when a French couple was having difficulty communicating in English at the restaurant. I was thanked profusely for my (very minor) assistance by what seemed like the entire staff, even by staff members who didn't witness the interaction. A stable of tuk tuk drivers is parked in the alley between the hotel and the resort. Apparently, they are not actually employees, but they seem to have some kind of relationship with the establishment, as they wear Rambutan T-shirts. Their prices are fixed, and they can organize a car if you prefer. I commissioned the driver who picked me up from the airport to drive me for the rest of my stay, which worked out well. As someone who packs very lightly, I gauge a hotel by the efficiency and quality of its laundry service. I'm pleased to report that my laundry was returned with 24 hours, nicely folded or on a hanger, as per my specifications. Location: The location is ideal from my point of view -- far enough from Pub Street and the main market to be quiet, but central enough to walk most places. Although the Rambutan is on the other side of the river from the Psar Chaa (Old Market), it's only a 5-6 minute walk over the main bridge. If you don't want to venture that far, there are plenty of places to eat and drink within 1 or 2 minutes of the hotel/resort. Recommendation: I heartily recommend staying at both the hotel and the resort. I know I'm not alone since Trip Advisor has awarded them a plaque. 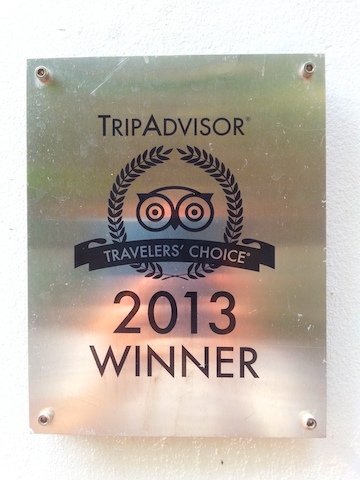 Plaque award to Rambutan Resort by TripAdvisor in 2013.